The "Waasmunster" completed repairs of the damage suffered in the collision with the French f/v "Gros Lolou CN.721860" off Le Havre on July 15, reached the port of Karsto on Oct 29 as first port of call after repairs in Flushing, which lasted from July 10 to Oct 20, and sailed again on Oct 30 bound to Wandelaar, ETA Oct 31. 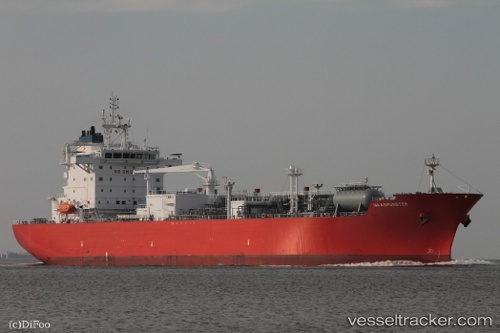 French fishing vessel GROS LOULOU collided with anchored on Le Havre anchorage LPG tanker WAASMUNSTER on the night July 15, MRCC Jobourg intercepted radio talks between vessels at about 0210 LT July 15. GROS LOULOU confirmed the collision with WAASMUNSTER , loaded with 18000 tons of butane. GROS LOULOU suffered bow damage, but there was no water ingress. WAASMUNSTER suffered hull breach below waterline with ensuing water ingress. Salvage teams including divers were delivered on board of tanker, by 0520 LT hole was sealed, holed compartment understood to be dried. GROS LOULOU reported to MRCC Jobourg water ingress at 0700, but not critical. GROS LOULOU safely reached port and docked at 0845 at Port-en-Bessin. As of 1100 UTC July 15, WAASMUNSTER remained anchored on Le Havre anchorage.